What’s on her business bucket list? Her advice for other biz owning moms? get started planning your own business with the mother run guide! Her goals for helping women don’t stop with Push Thru. “I would like to be able to travel around the world and learn more about different cultures and how those mothers handle the after birth experience,” she explains. “I would like to learn what other cultures use in products or remedies for the after birth experience in order to share with everyone. I’d like to learn about other cultures’ customs and traditions in the after birth experience. I find it fascinating. I would also like to fight for more maternity leave for working mothers. I would like to travel doing more work to bring awareness and support for postpartum depression.” Push Thru is only the beginning of her wonderful journey to helping as many mothers as she can. 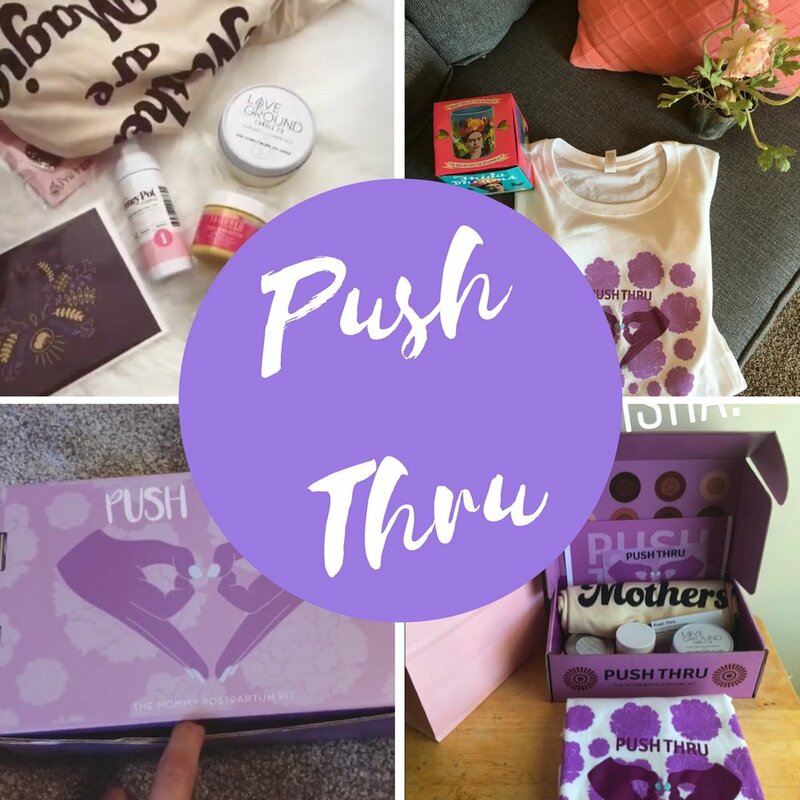 If you’re a soon to be mother, new mother, or looking for a special gift for a mom in your life, check out Push Thru. Not only is it a a game changer for helping mothers care for themselves post-baby but Keisha also stocks her boxes with wonderful products from other mother owned businesses! “Everyone in each of our Push Thru boxes are amazing,” she says. “Bee & Mae, Love Ground Candle Company, Olive and Elliot, Tailored Beauty, Butta Body, Abeadles Design, Hey Baby Atlanta, Jobbing with Jas, Bloom Voyage, I literally could go on. What I love about each of these are that they are all owned by mothers and they’re literally killing it every single day.” Talk about a truly Mother Run community! Emily and her four kids--ages 7, 3, 2, 1. Finding your identity after embarking on motherhood can be a tough and long process. In her happy place, behind the camera! When it comes down to the balance of mothering and business, a never ending struggle I’m sure we can almost all relate to, Emily says that “I’m really hard on myself...It’s not easy for me to turn ‘off’ work and that’s probably intensified because I’m always on-call and must be ready to attend a birth at all times. I push myself to wake up before my kids do, to spend time with myself before the crazy begins. Sometimes I answer emails and other business stuff, but most of the time I simply drink coffee on my porch in quiet. When they rise, I try to be fully devoted to them, this is when we focus on each other and our homeschooling.” While she has struck a pretty amazing balance between work and family, she couldn’t do it alone and is thankful for her husband who takes over when he gets home and allows her to get some work time in. In a society that often paints the intricacies of birth as sterile and even shameful, something to be hidden away and not discussed or shown, Emily’s family has taken a different approach. Her four kids are “absolutely obsessed with birth and anatomy. They find birth so magical and women so powerful. They are always asking about birth stories, to look at pictures and videos, and to learn about bodies. I hope this helps raise them into truly respectful adults, ones who look at women as powerful and equal humans instead of just property.” It is parenting like this that will hopefully allow the next generation to be more accepting and open about the birthing process as a whole and maybe begin to move away from looking at birth as something clinical and medical and instead see it for the amazing, personal experience it can be. Wise + Wild, the perfect mix of intuition and science.